The results are in on our recent poll that asked three questions about the amount of information available on the superfast broadband roll-out from Openreach, the BDUK and the various local authorities. The creation of the poll was triggered the end of another quarter that saw some cabinets have their Ready For Service data pushed back, and the apparent lack of detail about the projects in more traditional communications from local councils. The issue of Openreach pushing back dates (where dates are announced) is a common feature on our forums and some people have had dates in the checker for some years that keep getting pushed back. 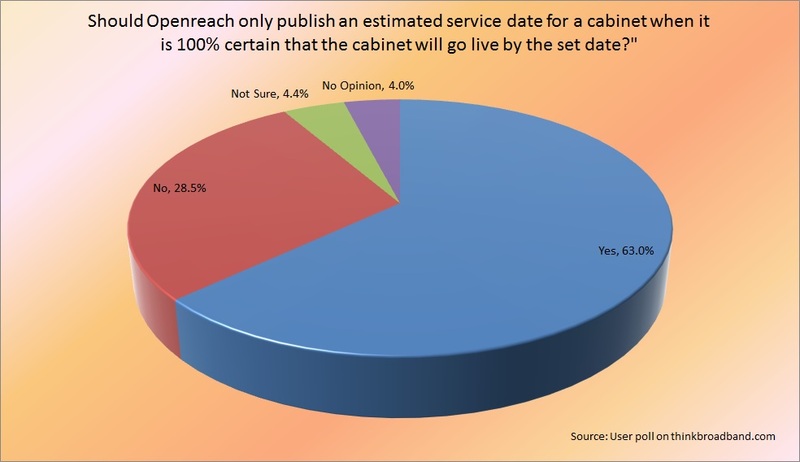 As always there are many variations of questions we could have asked, but with 63% saying that Openreach should hold back on issuing a date until it is certain that the date announced is correct there is definitely something that needs addressing. While at face value this would mean hiding roll-out information, we believe it would be fairer if Openreach was to publish three main bits of information, firstly that a cabinet/area is still in the roll-out schedule but no firm date has set and then once the service date is known it is published. The third bit of information being those areas which have been clearly rejected as outside the scope of the commercial and local authority projects. 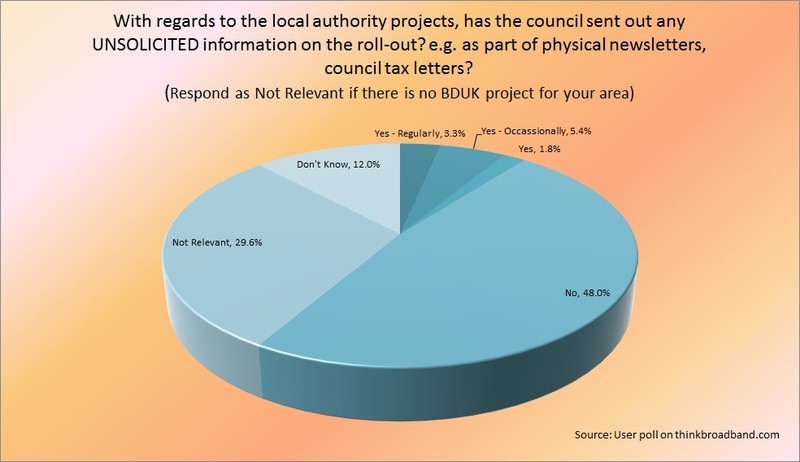 The second question looks more closely at the BDUK led project areas and how local authorities as well as the Welsh and Scottish Governments are handling roll-out information provision. Obviously not everyone responding is in the final third of the UK, hence the 29% who voted not relevant, but wanted to answer one of the other questions. 10.5% said they had received some form of letter or leaflet on the roll-out but four times that number (48%) said they had not. Now while many of our visitors may be more versed in the spotting of brand new fibre twin cabinets, many others with busy lives will not notice this sort of thing. Worryingly it is in the interests of councils to increase take-up as generally beyond 20% take-up so they can clawback some money from BT, either to re-invest in the project or return to council contingency funds that were raided to match fund the project. Our final question covered both commercial and non-commercial areas and was looking at how the broadband industry itself is performing in terms of information provision. 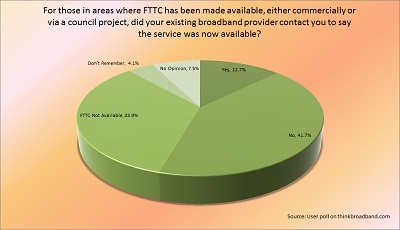 It appears the broadband providers are no better than the local authorities, 12.7% were contacted to let them know the new service was available and 41.7% had had no contact. Given broadband providers have access to the raw availability checkers they should be able to detect new cabinets and use these to target homes, especially existing customers who should be the easiest to convince to upgrade. The sample size in the poll is lower than usual at just under 1,000 responders, but with the polarised responses it is likely that running the poll for longer would not have had a significant impact on the result. We know many of the local authorities are busy promoting on facebook and twitter, which is great for engaging with the early adopter and tech community, but we need to remember that the UK has millions of people for whom online social media is not on their radar. Maybe it is wishful thinking, but perhaps in our 2015 council tax letters there will be information on how the money has been spent and which areas have seen improvements and for those missed so far what are the plans moving forward as we in theory progress toward the 2017 goal and beyond. We're itching to get fibre broadband, but I expect we are due for a mighty long wait in our part of Wales. I was unaware of Superfast Cymru's existence until my MP wrote to tell me about it a few weeks ago - there has been no awareness campaign round here, as far as I know. My cabinet got pushed back by 6 months just the other day (from 31/03/2014). Does anyone know if it’s even likely they meet their second date, or will it go back again? I took a copy of the Openreach coming soon list a couple of weeks ago and comparing it to the current one does show they are making some progress. About 30 exchanges seem to have been upgraded. However, just as many have been shifted from March to June. The big concern is that most of the exchanges now give a June date. I didn't realize that BT had that many engineers available to finish so many cabinets simultaneously! I think the results of the 1st question simply show who has experienced those frustrations, i.e. had no info at all (so want a date if it's planned at all) or had a date that was pushed back (so don't want a date until it is certain).What should be done is publish more info about status & individual cabs as an exchange date alone doesn't mean anything whatsoever, hence the split between the people who want a date and those who don't as in some cases it works & in others it doesn't.Hiding the date because a lot of people have seen theirs pushed back is not addressing the problem. Also note that Superfast Cymru and the Welsh councils already do NOT give out dates in advance. It seems this poll was instigated as a response to someone complaining that their advance dates have been put back, therefore they are obviously not in Wales. Can we have a specific poll for Wales or, generally, those in areas that do not publiush dates, to ask if people would prefer dates in advance even if they can change? The Connecting Cumbria website had quite a bit of information on it until the contract was awarded to BT now it is just a BT website with very little information on it and all previously published information now unavailable.